WASHINGTON (CNN) -- An average of five national polls conducted in July indicates that President Obama's approval rating has slipped to under 60 percent. New polls show President Obama's popularity slipping a bit. Fifty-seven percent of Americans surveyed approve of the job Obama's doing as president, according to a CNN Poll of Polls compiled and released Friday, with 36 percent disapproving. In early June, Obama's average approval rating was 62 percent. It dropped a point to 61 percent in mid-June and stayed at that level through the rest of the month. "Recent polls indicate that Obama's lowest ratings -- and biggest losses -- come on the public's perception of how he is handling the economy," said Keating Holland, CNN polling director. Holland adds: "And the latest CNN/Opinion Research Corp. poll shows a double-digit drop in the number of Americans who think that the president has a clear plan for solving the country's problems. The public may not be as willing to give Obama the benefit of the doubt after six months on the job as they did when he first took office." So how does Obama compare to his most recent predecessors six months into a first term? Former President George W. Bush also drew a 57 percent approval rating six months into his presidency, in July 2001. Bill Clinton stood at 48 percent in July 1993. Two-thirds of Americans polled approved of George H.W. Bush's job as president in July 1989, and six out of 10 gave Ronald Reagan the thumbs-up in July 1981. 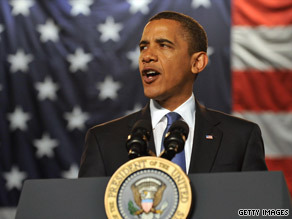 President Obama is set to give a presidential press conference Wednesday night. Watch it live on CNN. "Reagan, like Obama, got approval ratings in the high 50s and low 60s during most of his first summer in office," Holland said. "But as unemployment remained high, Reagan's approval rating dropped below 50 percent for the first time in November of 1981, and it stayed under 50 percent for the next two years." The national unemployment rate rose for the ninth straight month in June, climbing to 9.5 percent from 9.4 percent and hitting a 26-year high. Nearly 3.4 million jobs have been lost during the first half of 2009, more than the 3.1 million lost in all of 2008. One state in particular has been hit especially hard. Michigan became the first state in 25 years to suffer an unemployment rate exceeding 15 percent, according to a report released Friday by the Labor Department. The state's unemployment rate rose to 15.2 percent in June. It was the highest of any state since March 1984, when West Virginia's unemployment rate exceeded 15 percent. Michigan, which has been battered by the collapse of the auto industry and the housing crisis, has had the highest unemployment rate in the nation for 12 months in a row. CNN's Poll of Polls consists of five national surveys with interviews conducted in July: the Gallup tracking poll (July 13-15); Ipsos/McClatchy (July 9-13); Diageo/Hotline (July 9-13); USA Today/Gallup (July 10-12) and CBS News (July 9-12). The Poll of Polls does not have a sampling error. CNNMoney.com's Ben Rooney contributed to this report.